中文夏令營: 小朋友將使用中文來吟唱歌曲, 舞蹈, 參與遊戲, 透過手工藝活動, 練習他們的中文! Sanidas Academy in Long Island City is offering Mandarin Chinese Summer Camp for kids ages from 4 years old to 9 years old to study Language, History, Arts, Dance and Math in Chinese. Students will have sports/fitness classes at a professional gym as well as fun trips to a Chinese history museum or arts exhibit. This open house will offer free snacks and drinks. Some of our teachers will be at the open house for a meet and greet so that parents get a chance to speak with them in person. The summer camp programs will be 9 weeks long from July to August for only $1499 a month or $2800 for two months. The Sanidas Camp will be running from 9-3pm and students can stay until 4pm for free play or arts/crafts. 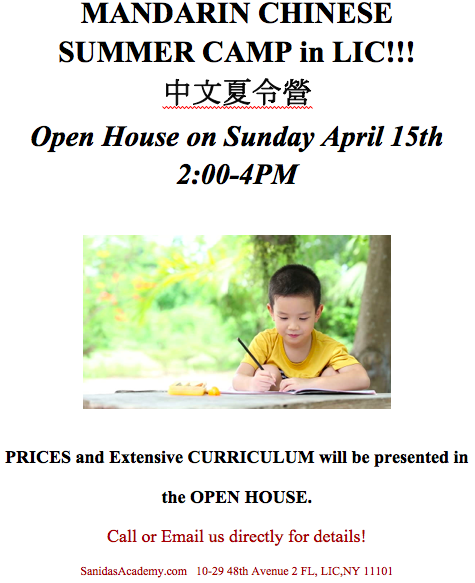 No user commented in " MANDARIN CHINESE SUMMER CAMP 中文夏令營 OPEN HOUSE "